Instead of improving the mathematical apparatus employed in the Algorithm SM-4, I decided to reshape the concept of modifying the function of optimum intervals. The Algorithm SM-4 tried to interrelate the length of the optimal interval with the repetition number. This approach seems to be incorrect because the memory is much more likely to be sensitive to the length of the previously applied inter-repetition interval than to the number of the repetition (previous interval is reflected in memory strength while the repetition number is certainly not coded - see Molecular model of memory comprising elements of the SuperMemo theory). Because of the above reasons I decided to represent the function of optimal intervals by means of the matrix of optimal factors - OF matrix - rather than the OI matrix (see Fig. 3.3). In accordance with previous observations the entries of the OF matrix were not allowed to drop below 1.2 (cf. the formulation of the Algorithm SM-2). changing the E-Factor category increases the next applied interval only as many times as it is required by the corresponding entry of the OF matrix. This means that even a great number of instances used in modification of an optimal factor will not change it significantly until the newly calculated value is used in determination of new intervals and verified after their elapse. The process of verification of modified optimal factors after the period necessary to apply them in repetitions will later be called the modification-verification cycle. The greater the repetition number the longer the modification-verification cycle and the greater the slow-down in the optimization process. To illustrate the problem of modification constraint let us consider calculations from Fig. 3.4. One can easily conclude that for the variable INTERVAL_USED greater than 20 the value of MOD5 will be equal 1.05 if the QUALITY equals 5. As the QUALITY=5, the MODIFIER will equal MOD5, i.e. 1.05. Hence the newly proposed value of the optimal factor (NEW_OF) can only be 5% greater than the previous one (NEW_OF:=USED_OF*MODIFIER). Therefore the modified optimal factor will never reach beyond the 5% limit unless the USED_OF increases, which is equivalent to applying the modified optimal factor in calculation of inter-repetition intervals. Bearing these facts in mind I decided to let inter-repetition intervals differ from the optimal ones in certain cases to circumvent the constraint imposed by a modification-verification cycle. I will call the process of random modification of optimal intervals dispersal. If a little fraction of intervals is allowed to be shorter or longer than it should follow from the OF matrix then these deviant intervals can accelerate the changes of optimal factors by letting them drop or increase beyond the limits of the mechanism presented in Fig. 3.4. In other words, when the value of an optimal factor is much different from the desired one then its accidental change caused by deviant intervals shall not be leveled by the stream of standard repetitions because the response qualities will rather promote the change than act against it. Another advantage of using intervals distributed round the optimal ones is elimination of a problem which often was a matter of complaints voiced by SuperMemo users - the lumpiness of repetition schedule. By the lumpiness of repetition schedule I mean accumulation of repetitory work in certain days while neighboring days remain relatively unburdened. This is caused by the fact that students often memorize a great number of items in a single session and these items tend to stick together in the following months being separated only on the base of their E-Factors. The modifier m will determine the degree of deviation from the optimal interval (maximum deviation for m=-0.5 or m=0.5 values and no deviation at all for m=0). In order to find a compromise between accelerated optimization and elimination of lumpiness on one hand (both require strongly dispersed repetition spacing) and the high retention on the other (strict application of optimal intervals required) the modifier m should have a near-zero value in most cases. The above formulas yield values a=0.04652 and b=0.09210 for m expressed in percent. The optimization procedures applied in transformations of the OF matrix appeared to be satisfactorily efficient resulting in fast convergence of the OF entries to their final values. However, in the period considered (Oct 17, 1989 - May 23, 1990) only those optimal factors which were characterized by short modification-verification cycles (less than 3-4 months) seem to have reached their equilibrial values. It will take few further years before more sound conclusions can be drawn regarding the ultimate shape of the OF matrix. The most interesting fact apparent after analyzing 7-month-old OF matrices is that the first inter-repetition interval should be as long as 5 days for E-Factor equal 2.5 and even 8 days for E-Factor equal 1.3! For the second interval the corresponding values were about 3 and 2 weeks respectively. EF - E-Factor of the considered item. To accelerate the optimization process, this new function should be used to determine the initial state of the OF matrix (Step 3 of the SM-5 algorithm). Except for the first interval, this new function does not differ significantly from the one employed in Algorithms SM-0 through SM-5. One could attribute this fact to inefficiencies of the optimization procedures which, after all, are prejudiced by the fact of applying a predetermined OF matrix. To make sure that it is not the fact, I asked three of my colleagues to use experimental versions of the SuperMemo 5.3 in which univalent OF matrices were used (all entries equal to 1.5 in two experiments and 2.0 in the remaining experiment). Although the experimental databases have been in use for only 2-4 months, the OF matrices seem to slowly converge to the form obtained with the use of the predetermined OF matrix. However, the predetermined OF matrices inherit the artificial correlation between E-Factors and the values of OF entries in the relevant E-Factor category (i.e. for n>3 the value OF(n,EF) is close to EF). This phenomenon does not appear in univalent matrices which tend to adjust the OF matrices more closely to requirements posed by such arbitrarily chosen elements of the algorithm as initial value of E-Factors (always 2.5), function modifying E-Factors after repetitions etc. Having noticed the earlier mentioned regularities in relationships between entries of the OF matrix I decided to accelerate the optimization process by propagation of modifications across the matrix. If an optimal factor increases or decreases then we could conclude that the OF factor that corresponds to the higher repetition number should also increase. This follows from the relationship OF(i,EF)=OF(i+1,EF), which is roughly valid for all E-Factors and i>2. Similarly, we can consider desirable changes of factors if we remember that for i>2 we have OF(i,EF')=OF(i,EF'')*EF'/EF'' (esp. if EF' and EF'' are close enough). I used the propagation of changes only across the OF matrix that had not yet been modified by repetition feed-back. This proved particularly successful in case of univalent OF matrices applied in the experimental versions of SuperMemo mentioned in the previous paragraph. 3. For all the entries modified in Step 2 repeat the whole procedure locating their yet unmodified neighbors. character of the memorized knowledge etc. The Algorithm SM-5 has been in use since October 17, 1989 and has surpassed all expectations in providing an efficient method of determining the desired function of optimal intervals, and in consequence, improving the acquisition rate (15,000 items learnt within 9 months). Fig. 3.5 indicates that the acquisition rate was at least twice as high as that indicated by combined application of the SM-2 and SM-4 algorithms! This distribution, in accordance to the assumptions underlying the Algorithm SM-5 , yields the average response quality equal 4. The forgetting index equals 11% (items with quality lower than 3 are regarded as forgotten). 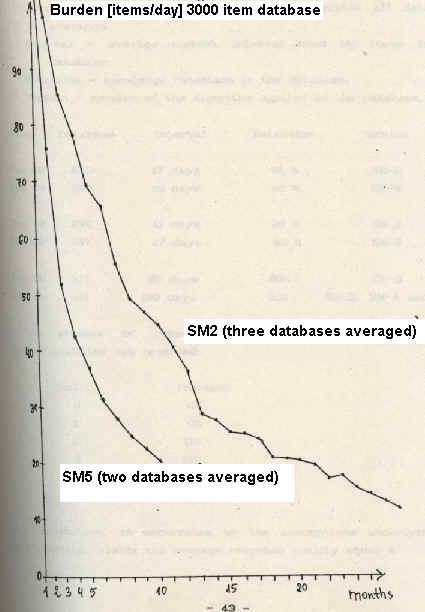 Note, that the retention data indicate that only 4% of items in a database are not remembered. Therefore forgetting index exceeds the percentage of forgotten items 2.7 times. In a 7-month old database, it was found that 70% of items had not been forgotten even once in the course of repetitions preceding the measurement, while only 2% of items had been forgotten more than 3 times. Concerning the convergence of the algorithm modifying the function of optimal intervals, it is too early for a conclusive assessment (see Fig. 3.6).